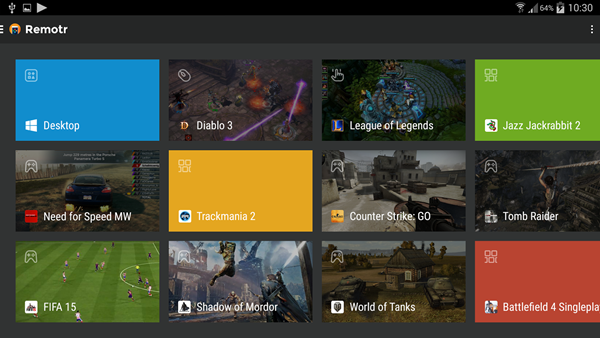 There are many gadgets like the Nvidia Shield that allow you to stream and play PC games on Android but now a new app called Remotr will allow you to play PC games on Android for free in a matter of minutes. The app is compatible with Windows Vista, Windows 7, and Windows 8 and also requires an Android smartphone with Android 4.1 and above, once installed on both your PC (download it here) and Android smartphone (check it out on the Play Store here) you will be able to start streaming video games on Android. As far as hardware goes, it its compatible with both AMD and Nvidia graphic cards. Remotr will allow you to play games like League of Legends on Android and Diablo 3, Call of Duty, Assassins Creed, Fifa, Counter Strike, Battlefield 4, World of Tanks and almost any game you can think of. The app has pre-configured controls and settings for more popular games but any game that doesn’t have the controls predefined can be configured manually to make it compatible with Remotr.